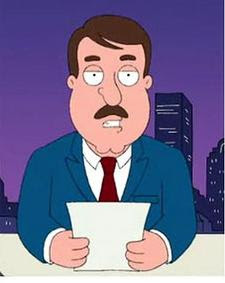 "Good evening, Quahog, I'm Tom Tucker. 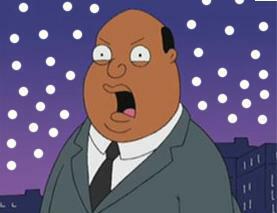 Now, for Ollie Williams and his summary of IDW's Infestation 2 #1. Ollie?" "H.P. LOVECRAFT WROTE SOME BOOKS!" "ALL THEM MONSTERS WERE REAL!" "Any interesting characters exclusive to this comic we should know about?" "Thank you, Ollie. And now for sports..."
*The TMNT's part of this story will begin in Infestation 2: TMNT #1. *Covert Vampiric Operations agents Britt, Cross and Bools previously appeared in Infestation #2 (which this event is a continuation of). *Infestation 2 also crossed over into IDW's other publications, "Transformers", "G.I. Joe", "Dungeons & Dragons", "Danger Girl" and "30 Days of Night". I'm not even that much of a "Family Guy" fan anymore, I just thought it would be fun to do this. One of the nice things about IDW's "Infestation" events is that you don't HAVE to buy the bookending mini or the other crossovers if you don't want to; you can just grab the TMNT chapters and get a complete story. 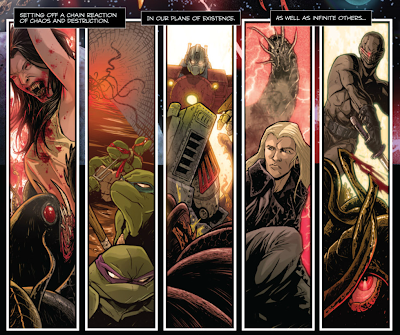 All jesting aside: IDW, I really, really appreciate that. Marvel and DC could learn a lot from you guys. 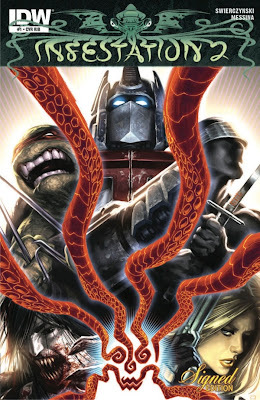 Oh, but those covers just scream "EPIC MULTI-FRANCHISE CROSSOVER!!!" I do wish we could see the characters interact in the bookend issues, if not necessarily in every issue of the crossover even.